American Animals is a fascinating true crime story; made even more engaging by its brilliant format. The film intercuts the portrayal of an infamous heist with interviews from the actual people involved. We learn the motivations of the characters from two key perspectives, real time and hindsight. It is a meticulous and highly creative exploration into the vagaries of human nature. Acclaimed documentarian Bart Layton reaches greatness with his first narrative feature. American Animals opens in 2003 Kentucky. Barry Keoghan stars as Spencer Reinhard, a disenchanted art student at Transylvania University. His middle-class, suburban life has left him hollow. He yearns for the passion and adventure that inspired the great artists. A chance tour of the school's library leads to a presentation of its rare book collection. The showcase piece, John Audubon's "Birds of America", is the most valuable book in the world. Evan Peters co-stars as Warren Lipka, Spencer's best friend from high school. Where Spencer was reserved and introspective, Warren was daring and outgoing. His personality was magnetic, but dangerously arrogant. They both felt existentially small, unhappy with their lives. Spencer's offhand suggestion of robbing the library leads Warren to concoct the brazen scheme. He recruits two more school chums (Blake Jenner, Jared Abrahamson) into the gang. They revel in the thrill of planning such an audacious crime. But learn the hard way where hubris and inexperience leads. American Animals grips you because the characters are recognizable. These young men weren't sociopaths or thugs. Nothing in their backgrounds or family dynamics would even hint at their behavior. They were suburban bred, given every opportunity to succeed in the American system. But everything wasn't good enough. They weren't hungry, poor, or mistreated, just bored. With Maslow's hierarchy of needs fully met, they yearned for something else to justify their existence. Evan Peters delivers a spellbinding monologue about this issue during a pivotal scene. It is a stark moment of truth from a character obsessed with pushing the envelope. Before the lemmings run off the cliff, one of them has to go first. American Animals is written and directed by Bart Layton. He's primarily known for the riveting television series, Locked Up Abroad. Layton is a gifted storyteller. His documentary style approach measures the impact of what we see. At first the film has an Ocean's Eleven vibe where the characters and crime are celebrated. That changes once the real participants start adding their commentary. The film starts to unfold in unexpected ways. The characters have differing viewpoints about what happened. Layton does not allow any of them to singularly dictate the plot. The audience is left to ponder the true substance of the film. American Animals reaches an extraordinary depth. I wish it had been released during the fall award season. Layton's fine work is worthy of recognition. 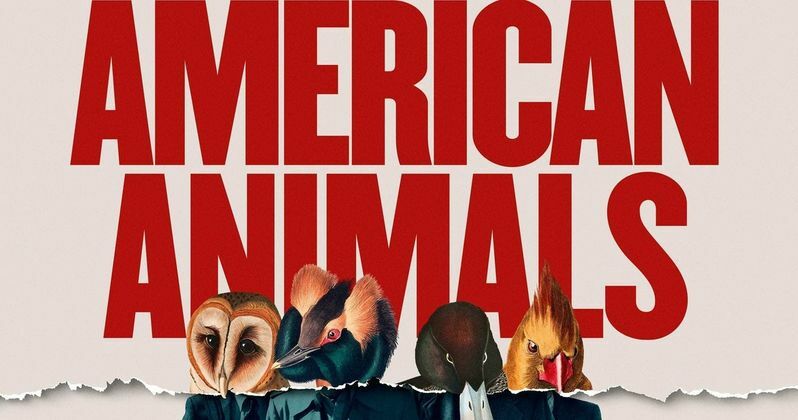 American Animals is an independent film released by The Orchard. Outside of the major markets, it may to be difficult to find. Hunt this film down if at all possible. It is an absolute gem.